If you leave stubble, you can rip the face off a guy you neck with. Careful grooming is a subtle clue to other gays you are gay even if you present in a very masculine way. Of the major shave cream brands I prefer Schick Hydro or Gillette Fusion ProGlide, but both are ridiculously overpriced. Gillette has a bit too much blue dye in it. It will stain a white washcloth. Gillette still makes lemon/lime-scented Foamy, which has a pleasant scent, but it is not as protective as the competition. Using solid shave soap No PayPal and a badger brush PayPal has the advantage of pleasant warmth, but I found the drug store soap lather was too thin to be much use. Perhaps a premium brand PayPal would work better. They throw in three free samples of your choice with each order, however, the Canadian supplier No PayPal was out of stock. I ended up buying a Parker Chrome badger brush, chrome drying stand and shave soap from a local supplier The Copper Hat PayPal here in Victoria. The brush is soft and luxurious. My roommate said the setup looked spiffy. Use a stand to let your brush dry with the bristles down. Don’t wring the brush dry. Just give it a shake. To whip up a lather, wave the brush back and forth as if you were painting rather than in a circle. I intended to buy lime shave soap, but on sniffing all the possibilities, I chose Copper Hat house brand bay rum — a blend of aromatic herbs. The soap at first took quite a bit of whipping to get a lather up. After a week to break in, it lathered up must faster. The foam is heavy like lightly whipped cream. Aerosols in contrast are stiffer like whipped egg white. You don’t use nearly as much foam. It feels heavier and oiler. It rinses easily off the razor. It is slipperier than aerosol foam. It leaves a strong fragrance on your face, which is not irritating because it has no nose-piercing chemicals in it. I used to find shaving a boring chore. Now it is something I look forward to, a sensuous experience, like a warm bath. 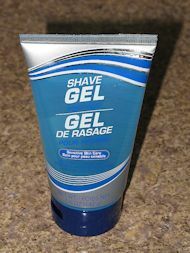 There is a no-name shave gel from China sold for about $1 in dollar stores that is slimy like sexual lubricant. The wholesaler is Greenbrier International in the USA and DTSC Imports Burnaby in Canada. If you use it, you can’t cut yourself. I find its feeling revolting and you must wash your face several times afterwards to rinse it off. However, you get very close shave without blood every time. Most shave products, including the Chinese one, have a potent, nose-biting sports perfume which lingers. In my teens I used Gillette Blue flat single-edge blades with heavy handles you unscrewed to reveal the blade or to open the pod bay doors. I would slice myself to ribbons every time. Purists still use them, but I consider them as barbaric as straight razors. Using one successfully is a bit like training to be an acrobat. As for blades I like the Gillette Mach 3. The three blades make short work of whiskers, though the head is a little oversized for easy maneuverability. I can use the same blade for a month, which offsets the stiff price they charge for them. I say Go away to gimmicks like vibrating or great boats with 6 blades. To get a clean, close shave, you need to use three senses. Listen for the sound of the razor running over uncut stubble. Scan your face for missed patches. Run your hand over your face against the grain. This is controversial, but if you want a really close shave you need to shave twice, once with the grain, then lather a second time and shave against the grain. If you religiously shave every day, missing a spot will not be too noticeable, since you will get it on the second day. Shaving is one area is your life where even the poorest person can afford to go first class. Even though the products are expensive for what they are, they last quite a while, so the daily cost is minimal. I am surprised someone has not yet invented an electrically heated bowl for whipping up shaving cream. It would work faster than a hot-water heated bowl and would keep the lather warm longer.